Bread Or Death Book | The war brought about scarcities of just about everything…except misery. The war brought about scarcities of just about everything…except misery. 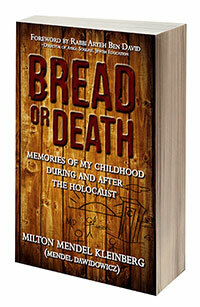 Young Mendel (Milton Kleinberg), from age four to fourteen, tells in vivid detail the wretched journey in cramped cattle cars through frigid Russia, the indignities of being forced into labor, the shame of begging for bread just to survive, and death of those closest to him. The family’s plight includes abandonment, hunger, and separation (and later remarkable twists of fate and reunion) quite unlike other Holocaust stories. A few months ago, Milton spoke at the Elkhorn Public Library to an overflowing, packed crowd. Many people were turned away because of such a small space in the library, but we estimate around 150 people came out to hear him speak! Thank you so much to everyone who came out and our sincere apologies if you were unable to get into the library that night. But I’m happy to announce we’ve finally received the audio recording from that event! The speech was part of a “Stories of Survival” event put on by the Omaha Public Radio, where they showcased Milton and three other local Holocaust survivors over the course of four weeks at different Omaha area libraries. The speeches were then broadcast on Omaha Public Radio KIOS 91.5 FM in January and the video above is of that broadcast. Please enjoy! On Tuesday, October 18th from 5-6pm CST Milton Kleinberg will be interviewed on Armstrong Williams’ national radio show called The Armstrong Williams Show on Sirius XM Urban View, Channel 126. Armstrong is an entrepreneur and political commentator, who has a deep interest in the Holocaust and educating our youth. You can also listen to the radio show here if you don’t have Sirius XM radio. So make sure you tune in on your radio or your phone while driving home from work on Tuesday to hear Milton! We received this review of Milt’s book, Bread or Death, today from a librarian. Kleinberg wrote this account of his and his family’s experiences during World War II to answer questions for his grandchildren. I’ve read many Holocaust memoirs and there was a lot here I’d never come across anywhere else, so I was left feeling I’d learned something significant about both the history and the workings of human nature. Strangely, after reading some of the most heartbreaking and shocking stories I’ve heard from this time period, this book ends up being one of the most optimistic and positive from this genre that I can remember. These two extremes in one person, in one life, are fascinating – I think anyone with an interest in human nature would find this a great study. And truly, the most amazing thing about this story was Kleinberg’s unshakeable optimism. He writes unapologetically about certain things he did in order to survive that are jarring, to say the least. But he frames them in the context of this survival at any costs, especially the determination to keep going after what they’d already been through. He even contrasts these choices with the character of those making them, their behavior before and after the time of their persecution. For such a sad and difficult story, by its end he paints a wonderful, upbeat picture of what a survivor can do with the world that’s left to them, what they can make of their life after going through and hell and coming out on the other side. That optimism and achievement can be a welcome lesson for us all. The book contains a great teacher’s guide, and I think this text functions perfectly as an educational tool. The simplistic writing style and conversational tones also make it accessible and suitable for young adult readers. It’s good to have additional stories from this time period, another voice and experience to read alongside classics like Anne Frank. In reading a little bit about the author, I found that he still does a lot of public speaking in the United States, and I can see why he’d make a popular speaker. He writes the book almost as if it were an oral history being recorded, telling his stories very directly and without a lot of philosophy or interpretation. Just direct, bluntly, and there’s a lot of power in that. It works for his tone and experience. I was impressed by his personality, he’s the type that after reading about his early life and how he made a happy beginning for himself in America, you’d love to have a chat with him. Thank you so much for your support and for this amazing review! What a great turnout Milton had at the La Vista Public Library a few weeks ago! The library staff had to add almost two full rows of chairs because people kept coming. In the end, almost 50 people were able to stop by the library and hear Milton tell his story. Thank you so much to the ladies at the library for all your hard work in putting this event together! Milton’s wife, Marsha, and daughter, Cindy, (who flew in from Israel!) were also in the audience to hear him speak. Even after hearing him speak many times, it never ceases to captivate them as well! Just a reminder that Milt will be speaking at the La Vista Public Library in La Vista, NE tonight, Wednesday, July 27th, at 6:30pm. The address is: 9110 Giles Rd, La Vista, NE 68128. This review of Bread or Death was recently sent to us by Brittany Miller of Greenwood, IN, a young mother of three girls. “From the time I was first vividly exposed to the Jewish Holocaust in 8th grade Literature class, a deep interest and insatiable drive to learn more of the courage and heartache faced by God’s chosen people, the Jew, was born. I had read many accounts of Jews surviving in Eastern Europe but very few survival stories of Jews from Russia and Ukraine under Stalin. I stumbled upon ‘Bread or Death’ in my search and it has been perhaps the best memoir I have ever read. Thank you Brittany for your wonderful review and kind words! Milt will be giving a presentation at the La Vista Public Library in La Vista, NE on Wednesday, July 27th at 6:30pm. Everyone is welcome, so please spread the word! 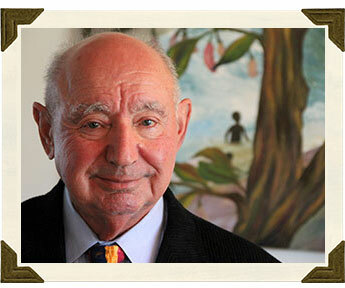 Who is Milton Mendel Kleinberg?